Hi Everyone! And welcome Ellie Inspired readers who are stopping here on Day 12 of the Twelve Days of Christmas blog hop. I am so excited to be participating. If you missed a day you can find all the links here. Weren't those Riley Blake stockings so cute!! I think it is really fun to give a handmade gift at Christmas. Are you making any Christmas gifts this year? You still have time to whip up something special for your sister, daughter, mom, or BFF. 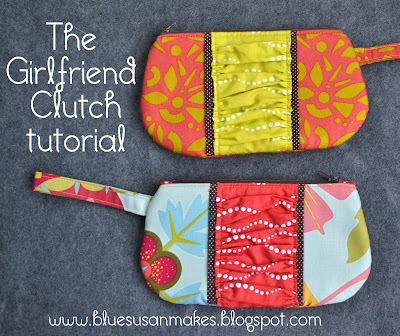 Today I'm sharing a tutorial on how to make my Girlfriend Clutch so you can make one too. Follow along and I'll show you how it's done. You'll need a 9 inch zipper (or longer). Strap- 11 in. X 3 in. Iron fusible fleece or felt to the wrong side of exterior pieces. Do not put iron directly on the fleece/felt. It will melt. Lay accent panel right side down on ironing board. Fold each long edge over 1/2 inch and press. Sew a gathering stitch (longest stitch length on your machine) about 1/8 inch from folded edge on each side. Pin each short edge to the center top and bottom of front exterior. Gather the fabric to the width of the clutch. Slip the accent strips just under the gathered edge and pin in place. Topstitch the gathers, stitching just to one side of the gathering stitches. Pull out the gathering threads and set aside. Take strap and fold long edges toward center of wrong side of fabric 1/2 inch on each side and press. Fold in half matching folded edges and press. Basically you are making a strip of double fold bias tape. Topstitch about 1/8 inch away from each long edge. Fold finished strap in half and position it about 1 in down from the top on one of the exterior pieces, baste in place. Fold pocket piece in half lengthwise. Center pocket over the middle of the clutch interior, matching the pocket raw edge to the bottom, pin in place. Topstitch in two places to form pockets. Backstitch at the top of each pocket so it's nice and secure. I like to make my center pocket wide enough to slip a credit card into it. The small pockets on each side are great for lipgloss. Make it how you like it. Turn piece over and trim the corners to match the exterior. Sew around the raw edges with a basting stitch. Take one lining piece and lay it right side up.Center the zipper, teeth up, along the top of the lining piece (my zipper happens to be extra long). Position the zipper about 1/8 in from the top. Lay an exterior piece down on top with right side of fabric down. Make sure your exterior and interior pieces line up and pin in place. You created a little zipper sandwich. Using a zipper foot, stitch 1/2 inch away from top edge. Use the zipper teeth as your guide. Fold exterior and interior pieces back to expose zipper matching wrong sides together. Press and topstitch 1/8 in. away from seam. Repeat for the other side. Unzip zipper at least halfway. Match exterior and interior pieces right sides together and pin in place. Fold zipper toward the exterior side. Starting at the bottom of the interior, sew around the clutch with a 1/2 in seam allowance on the interior pieces and a 1/4 inch seam allowance on the exterior. Leave a 3 inch opening in the bottom of the clutch. Clip curves and trim zipper. Turn inside out through interior opening. Fold raw edges in and stitch interior opening closed. Press the outside so it looks nice and crisp. Now you have a pretty little clutch to give as a Christmas gift. If you like this tutorial, please follow me or friend me on facebook. I'd love to know if you make one too. Oh, and if you are curious about this lovely fabric I used, it is from the Lucky Penny line by Allison Glass. I couldn't pass it up at the Quilt Market sample spree! Thanks Laura, it's been fun! I wonder who the lucky 35 giveaway winners are?? Happy sewing and Happy giving! your clutch is sew cute, perfect for my teeny greatgranddaughter! thanx for the tute. oh my gosh, this is so adorable! Can't wait to make a few. Thanks!!! So nice! Great tutorial. Thanks for sharing! That's really cute and your instructions are very clear. I'm teaching my daughter to sew and this contains some great new skills for her (easy zipper, gathering, sewing a gentle curve)!! Thanks for the tutorial.